Brandon is a gradute of William Paterson University and holds a Bachelor of Music degree in Sound Engineering as well as a concentration in Classical Music. He studied Guitar Pedagogy at WPU after 13 years of playing guitar and taking lessons. At WPU, Brandon gained experience and feedback in creating private and group lesson plans and worked on developing techniques to capture the attention and focus of any age group. Brandon's educational philosophy is that a music education should be built on a solid foundation of theory, both classical and contemporary. However, a true modern musician knows when to use their ears and ignore theory to create new and exciting sounds. It is key to learn the rules, then learn to break them. It is very important for any serious musician to be able to communicate musical ideas and converse with other musicians of various instruments and backgrounds. 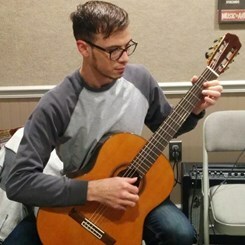 Brandon plays all styles of guitar - specializing in Classical Guitar, and toured with Kung-Fu-Necktie (a punk rock band) in Philadelphia, PA.
Request Lessons with Brandon today!